You remember in my post a while back that I stated that trains can pull more freight for their fuel load than trucks? Well in my recent Fortune magazine there was an ad from Norfolk Southern railway that stated that their engines get 410 MPG. Now this caught my attention, so I read the ad. 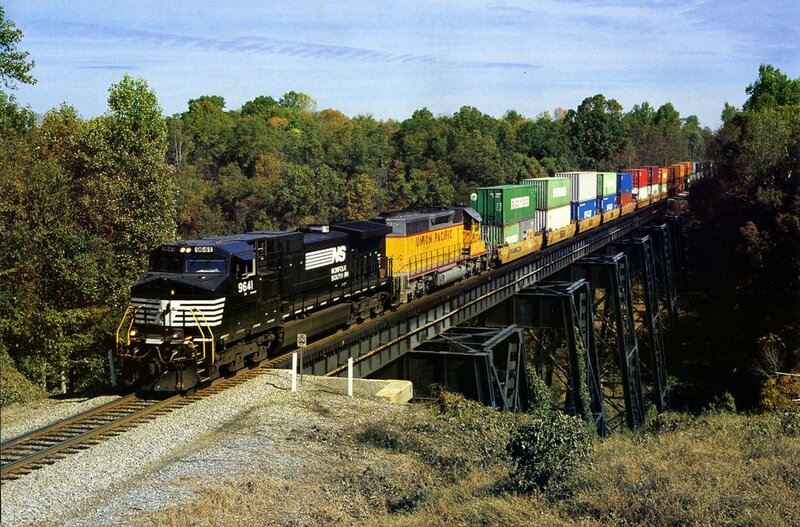 (I have tried all over the place to find the ad or get it scanned onto here but haven’t been able to make it work) Basically they are stating their trains can pull one ton of freight 410 miles on one gallon of diesel fuel. I’m curious what trucks can do. I tried to find the mileage on trucks but it doesn’t seem they really put that information out there, so I’ll be very nice to semi trucks and say they get 10 mpg. That seems fair don’t you think? How much weight can a truck carry? I really have no idea. Perhaps 5 tons on average? Maybe more? What constitutes a “heavy load”? Let’s just assume they haul 5 tons. Some probably carry less. I imagine a truck full of Fritos weighs very little while a truck load of cars or Pepsi’s would be very heavy. But if a truck holds 5 tons and it gets 10 MPG then wouldn’t it be able to go 50 miles on one gallon of fuel if it only had 1 ton? So, a train is 8 times more efficient per ton of freight in its use of diesel fuel. Now, I know that this is a seriously simple exercise and there are plenty of variables here and we don’t even know how accurate the train company’s number is, but it still bears weight about showing how much more efficient trains are than trucks. You know what else is cool about trains? They pay for their transportation needs as part of their business. Yeah trucks pay use taxes and tolls, etc, but that doesn’t come anywhere close to covering the cost of the roads they travel on. But trains bear the cost of their rail system completely. They might get some tax breaks here and there on it (and I bet trucks do too) but that is a huge difference to our society from trucks. One maintains its own system for its use and the other acts like a parasite on a system funded by tax dollars. Well…the problem with the simple math on the truck is that a truck also weighs quite a bit, maybe 1 or 2 tons (or more?). It hauls its 5 tons plus its own weight. So it would take more than 1 gallon to go 50 miles with a 1-ton load. I wonder if the train folks cacluated the weight of the train as well–most trains have at least the engine to pull in addition to the cars. Some have multiple engines. PS, thanks for the comment on my blog !